Around 70 per cent of all commercial kitchen fires originate from faulty ventilation and ducting due to a build of up fat and grease. Due to this, it is so important to clean kitchen extract system on a regular basis. 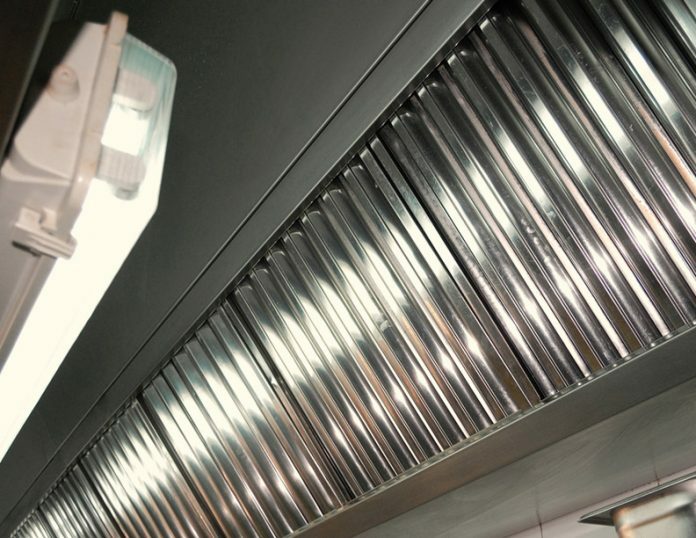 Often chefs and kitchen managers believe that if the canopy and filters look clean, the job is done. However, the problem is that if the ductwork behind the kitchen extract system isn’t clean, then one can put his staff and even customers at risk. It is crucial that extract systems are regularly cleaned. Their purpose is to remove cooking odours, steam and greasy vapours from cooking appliances, which can then act as an ignition source. Flammable vapours constantly give off during the cooking process. These cooking oils can reach temperatures of up to 300 degree centigrade and it only takes one spark to ignite raging flames within the ductwork. Grease extract ductwork systems usually spread through the entire breadth of a building which means that in the event of a spontaneous fire, flames will spread throughout the entire premises, putting every occupant of the building at serious risk. One can imagine years’ of grease gathered inside catering facilities ductwork. Everyone within that building including employees and customers, are like sitting ducks. Grease-laden deposits in extract ventilation systems are the biggest fire risk in a premise with operating kitchens and catering facilities. Grease deposits will inevitably seep through filters located in canopies which then give the grease particles time to not only cool but settle on the internal surfaces of the kitchen ductwork. This collection of grease will also reduce ventilation efficiency which can lead to excessive humidity, over-heating, unwanted odours and an inability to successfully remove potentially toxic fumes found in gas-burning appliances. Regular cleaning kitchen extract system is essential to maintaining a healthy working environment for staff. The kitchen extract system presents particular hazards due to the potential for the accumulation of grease. Accumulated grease within an extract system forms a hidden combustion load. Under certain circumstances flame or very high temperature within the duct can ignite the grease causing fire to spread rapidly through the duct. Flame and heat within the duct can ignite surrounding materials at various points along the ductwork path and transfer fire in ways that are difficult to predict and control by designers, installers and ultimately fire fighters. Canopy: This would most likely include a vertical canopy skirt running around the perimeter of the canopy. A channel on the bottom edge of the skirt; a canopy roof sitting horizontally on the top of and joining the skirts; a grease filter housing assembly (with grease filters and traps) hanging within the boundary of the skirts. Canopy/Extract plenum: This is typically the area immediately behind the grease filter housing and below where the ducting commences. Ducting: Beyond the canopy/extract plenum, extraction ductwork would be connected. This may involve short transition ducts connected directly to the suction side of an extract fan or could include many linear metres of horizontal or vertical ductwork. Contained within the ducting, there may be attenuators, flow control dampers, fire dampers, air turning vanes and sensors. Extract Fan: To create extraction from the canopy an extract fan would be connected to the ductwork, some extract fans (roof mounted) discharge directly to atmosphere via a cowl. Discharge Duct : On the exhaust side of the fan, a discharge duct would direct extract air out of the building via an outlet. This outlet point may include weather louvers and mesh to prevent the ingress of weather and vermin. Other systems such as ventilated ceilings and directly ducted extraction are also used. It is important that the person responsible for implementing cleaning regimes clearly understands the breakdown of the system so that any cleaning regime is compliant with the terms of buildings insurance relevant to the kitchen extract maintenance. Table 1 includes components, such as fire dampers and attenuators, which are not normally recommended to be installed, but are often found in practice. 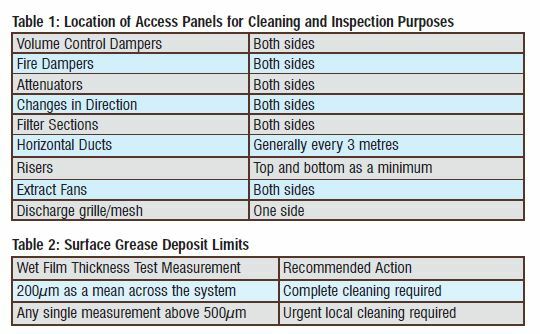 Table 2 sets out guideline maximum levels of grease deposit and actions recommended. The actual recommended action timing will depend on the rate of accumulation, the risk vulnerability of the system and site and any particular warranties imposed by the building insurers. 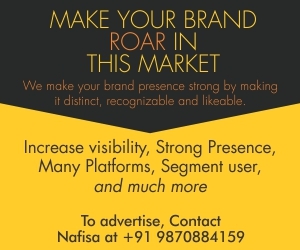 As there are many existing methods that can be applied in tandem, and emergent new technologies. The actual method or methods must be capable of achieving the required results, i.e. Post-Clean Verification, not only on the internal surfaces of the extract duct but also on system components. When choosing the cleaning method, consideration should be given to operative safety and also to effects on the surrounding environment, particularly where using wet cleaning methods, since grease or moisture can leak from the ductwork components and damage the surrounding fabric. Steam cleaning and high pressure water washing are not recommended for ductwork that is situated above false ceilings or in sensitive areas, due to possible leakage of contaminants from the duct, unless specifically designed for wet cleaning. After applying wet cleaning methods care should be taken to ensure that any condensed vapours and cleaning fluids are removed from all parts of the system. Cleaning kitchen extract system is essential to maintaining a healthy working environment. Extractor fans require regular cleaning and servicing in order to maintain maximum air flow in kitchen. If they are blocked up with dirt and grease, they are not going to be able to remove heat, cooking odours and most importantly carbon monoxide as efficiently. Carbon Monoxide is well known for being a deadly toxin that is produced by cooking ranges. Block ducts only contribute to problems associated with CO.
Whilst canopy kitchen extract systems contain filters that act as a first line of defence against grease, unfortunately it is inevitable that smaller particles will pass through the filters into ductwork. Whilst kitchen extract system will be easy to access, the ductwork behind it can be much trickier. However, this doesn’t mean that one can get away without cleaning it. Ignorance to clean kitchen extract system’s ductwork can potentially cause a fire. Due to the size and complexity of kitchen extract systems, most companies tend to hire in professionals like duct busters to clean ducting. Access doors are another legal requirement, so if one does not has them installed, he or she is at risk from being prosecuted in the event of a fire. Cleaning is routine maintenance for all equipment in the kitchen including kitchen exhaust ductwork. In fact, due to the increasing complexity of ventilation systems, it’s more crucial than ever to ensure a professional cleaning that covers all corners of the system. If one wants to maintain a healthy working environment, lower the risk of fires and avoid getting into trouble with the law, the easy answer is to clean kitchen extract system on a regular basis. The frequency of kitchen extract ductwork cleaning depends heavily on the number of hours per day the kitchen is in use. Low use would be considered as 2-6 hours per day in which case, yearly clean should be sufficient. Moderate use spans between 6-12 hours per day and this requires a professional cleaning service every six months. If the kitchen is deemed ‘heavy use’, this means that it is operational from 12-16 hours per day and is in need of an expert cleaning procedure every three months. These are minimum guidelines and the requirements of individual kitchen ductworks may vary.